If you’re not already in love with Verso, this travel-sized edit of best-selling products is guaranteed to make you fall head-over-heels (and save you almost £20 - the kit's worth nearly £60). Experience this collagen-boosting, wrinkle-plumping, skin-rejuvenating range with the Foaming Cleanser (25ml), Day Cream (15ml) and Night Cream (15ml), all housed in convenient (hand-luggage compatible) tubes. Gentle and non-drying, Verso’s Foaming Cleanser quickly eradicates make up and impurities without upsetting skin’s delicate protective function, then Day Cream keeps skin looking fresh and luminous from morning ‘til night – smoothing creases, enhancing radiance, brightening imperfections and providing protection from sun damage, without the tell-tale film left behind by so many skin care/sun care hybrids. 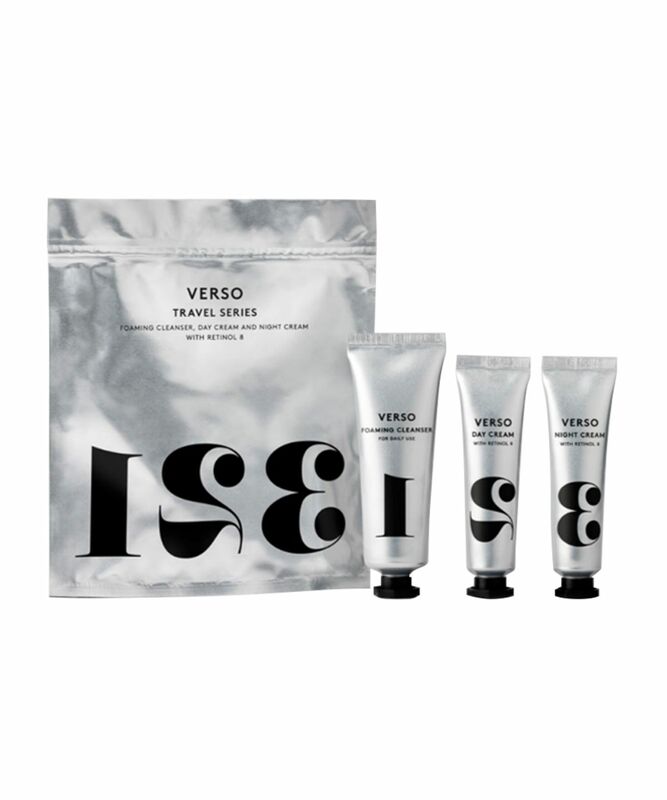 Soothing and strengthening, Verso’s Night Cream feels instantly hydrating – replenishing moisture and relieving irritation with the signature Retinol 8 Complex, together with oat-derived antioxidants which ward off attack from environmental aggressors, so your skin is free to focus on un-doing the day’s damage. 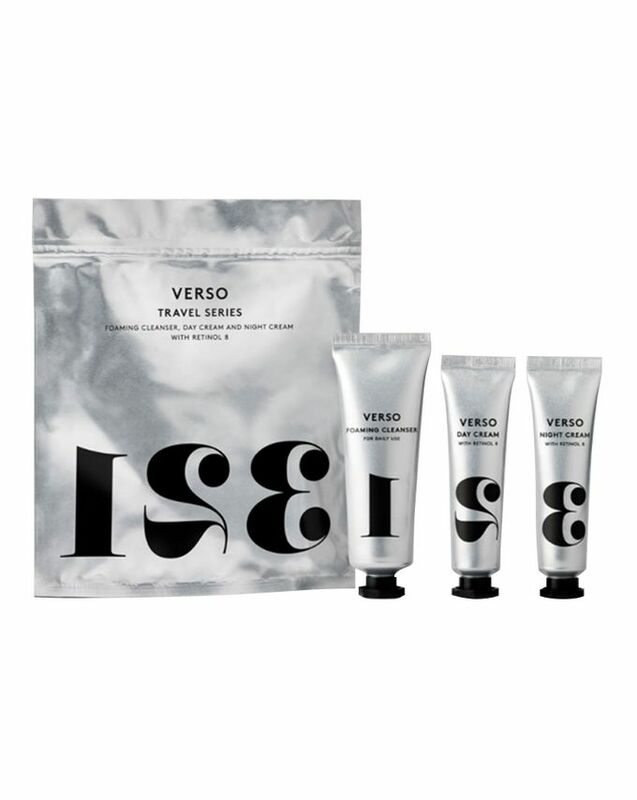 A brand new dawn in age-defying skin care, Verso have revolutionised the future of retinol with their signature ‘Retinol 8 Complex’; eight times more effective than typical retinol in the same dosage, this phenomenal range harnesses all the skin rejuvenating benefits of vitamin A, in a potent concentration which all but eradicates the risk of irritation. By training cells to mimic the behaviour of younger skin, you (and everyone you know) will quickly see a vast improvement in your skin’s luminosity and texture, as well as a dramatic decrease in the depth and visibility of lines. Named after the latin for ‘reverse’, and housed in exquisite award-winning packaging, Verso have made anti-ageing as easy as 1, 2, 3! Please see individual products for use. Great way to try retinol. I bought this kit at the end of September, and bought it again in the winter, and now in April. I can really see the difference in my skin, my pores became smaller and lighter and the tone of my face became more even. Both day and night creams contain retinol, so I used both at night. The cleanser is really mild, I'm thinking about buying the full-size. I have sensitive, allergy-prone skin, and these products made it look better and healthier.